Suzanne and I visited the Yuma East Wetlands on Saturday morning (25 Aug 12) morning for an hour. This location does not have yet have the more mature habitats associated with the West Wetlands, but with its ponds and extensive marsh, it’s far better for water-loving birds. 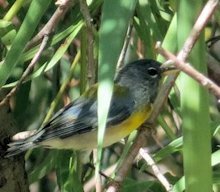 We saw our first BELTED KINGFISHER and YELLOW WARBLER for the season, and found many of the regulars, including LEAST BITTERN and BELL’S VIREO. The next day I had our first NORTHERN FLICKER of the season. Last Sunday (18 Aug) we spent about two hours at the West Wetlands. It was only about 90 degrees, but humid. We had a good morning, with a nice mix of migrants and residents, and wound up with 43 species total. A few birds were even singing, like one the CRISSAL THRASHERS. 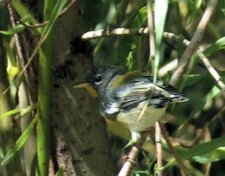 The best bird was a male NORTHERN PARULA that Suzanne spotted at the northwest end of the pond below the hummingbird garden. 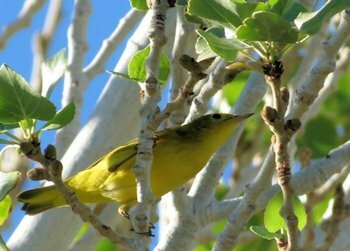 Migrants included: PACIFIC-SLOPE FLYCATCHER (3), WESTERN WOOD PEWEE (2), WARBLING VIREO (1), MACGILLIVRAY’S WARBLER (1), WISON’S WARBLER (1), WESTERN TANAGER (2), and BLACK-HEADED GROSBEAK (5).